In April 1867, African Americans in Richmond organized protests against the privately operated company that refused to allow them to ride its horse-drawn streetcars. 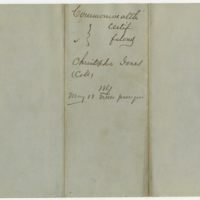 Christopher Jones had tried to board a streetcar and was arrested for disturbing the peace after a large crowd assembled to support his insistence that, having bought a ticket, he was entitled to ride the streetcar. African Americans in the crowd reportedly shouted, "Let us have our rights," and "We will teach these d—d rebels how to treat us." Jones was indicted for "feloniously and maliciously" conspiring to "incite the Colored population of the said City and State to make insurrection by acts of violence and war against the white population," but on May 18 the court issued a "nolle prosequi," or an order not to prosecute his case. 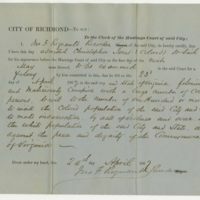 Richmond Indictments, Presentments, etc., 1867, Commonwealth v. Christopher Jones (Colored), May 18, 1867, Barcode number 1011296, Richmond City Hustings Court Records, Local Government Records Collection, Library of Virginia. 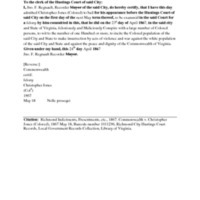 John F. Regnault, “Indictment of Christopher Jones in the Richmond City Hustings Court,” Remaking Virginia: Transformation Through Emancipation, accessed April 21, 2019, http://www.virginiamemory.com/online-exhibitions/items/show/587.